In one of my frequent sojourns down the rabbit-hole of the internet, I stumbled on these wonderful 19th century railway maps. The map above was created by Joseph Beers in 1884 to depict the railroads of the Austro-Hungarian Empire. His map cleverly used colors to differentiate between the railway companies. 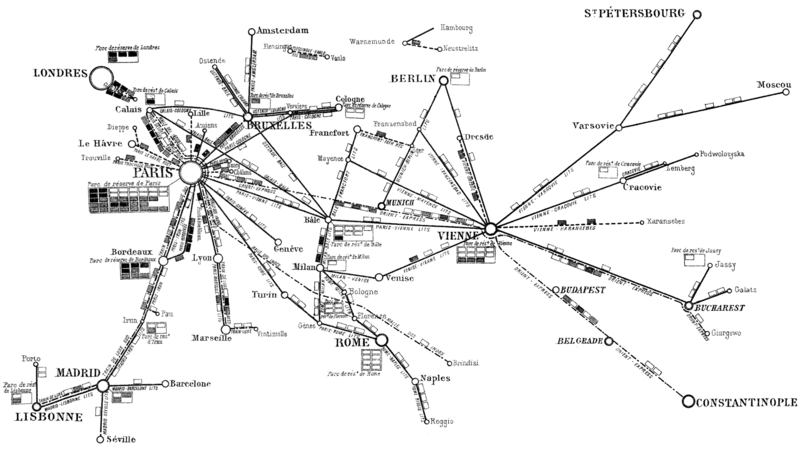 The diagrammatic map below was published in 1890 in the French rail journal Revue Générale des Chemins de Fer. The unidentified cartographer proportionally positioned major cities connected by rail routes for the famous Wagon Lits lines. This entry was posted in Europe, History, Maps, Public Transport and tagged Austro-Hungarian Empire, Constantinople, Paris, railways, Vienna, Wagon Lits. Bookmark the permalink.